At 0520 on June 7, 1945, Flight Petty Officer 1st Class Kazumi Hashizume took off from Ishigaki Airfield as pilot of a Zero fighter carrying a 250-kg bomb and died in a special (suicide) attack east of Miyakojima at the age of 20. He was a member of the Kamikaze Special Attack Corps 21st Taigi Squadron. He was from Wakayama Prefecture and was a member of the 16th Hei Class of the Navy's Yokaren (Preparatory Flight Training Program). Later he became a member of the 205th Naval Air Group. Finally the time is drawing near when I also will live for an eternal cause. My death is just my devotion to the country so I can repay a ten-thousandth of the Emperor's benevolence. With one plane I will sink one ship, and I will sacrifice myself so the Emperor's heart may be content. Also, I will strike my older brother's enemies. – Transfer my benefit in the house to my younger brother Shigeru. – Distribute equally the insurance money to my parents. – Make the funeral simple. – Let the family live in happiness. – Thank the relatives and neighbors for their kindness during my life. I enclose the short sword given to me by the commander and my flight muffler. Give my warmest regards to the Inaba Family and to Miki. I ask that you show filial piety to our parents. I am going to older brother Masami's place. We will protect you. I die gladly. Do not cause worries for our parents. Even after I die, please be cheerful more than ever. I pray that you be good girls and become good women and that the family have good health. No matter how long I write, there is no end. If we do not die, a hundred million  will be destroyed. Thinking about that, do not be sad for me. The letters and poem come from Matsugi (1971, 133-5). 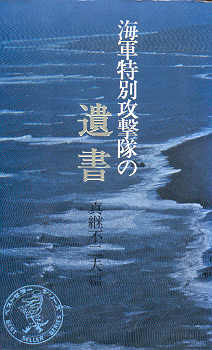 The biographical information in the first paragraph comes from Matsugi (1971, 133) and Osuo (2005, 178). 1. Yasukuni Jinja in Tōkyō is Japan's national shrine to honor spirits of soldiers killed in battle. 2. The "hundred million" refers to the entire population of Japan who were prepared to fight to the end.